Chitralis are very found of hunting. When a hunter goes to hunt and succeeds, he will sing a song to praise his game, ibex and markhor etc. On the way back to his house he will again sing so that the villagers will know that he came back with his prize. The hunting song is called ghoru which is sung alone by the hunter and without using any instrument. I have heard another style of hunting song in Mastuj rai baiyu , a song for collective hunting . It was sung in a chorus accompanied by dancing, a style called northic or pastok . 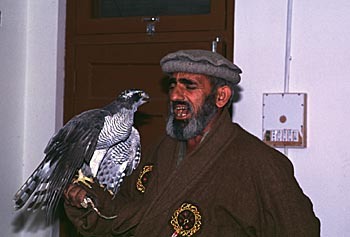 Meanwhile, shodong is a song when the people catches a falcon for the purpose of falconry. Like ghoru it is sung alone by the hunter at the time when he catches the falcon and also when he comes back to the village. When he enters the village and starts the song the villagers will welcome him with nuts and sweets, put flour on his face and conglatulate him. A cow will be slaughtered, rice boild and the feast will begin. All of these tradition seems to be dying out but still there are men who say that they still practice it or remember practicing it.